Two members of the NorthBay Medical Center’s Rapid Response Team examined the patient in her bed, determined to find the cause of her sudden decline. Observing her vital signs on the cardiac monitor, they listened as she described her symptoms. Respiratory Therapist Darrell Waite and ICU nurse Nora Maligaya, R.N., then sprang into action. Waite placed an oxygen mask on the patient’s face, while Maligaya discussed the patient’s medical history with her assigned nurse. a high-tech, computer-operated patient simulator—was set aside while her caregivers discussed the patient’s condition and their actions with clinical practice manager Elisa Jang, R.N., and Respiratory Therapist Rebecca Prenton. This time the training was part of the annual recertification exercise for Rapid Response Team members, but during the past year, more than 400 hospital caregivers have used the Clinical Simulation Lab to sharpen and advance their clinical skills. “We can simulate many levels of care, from the emergency room to the ICU,” says Ivan Fronefield, simulation lab coordinator. Fronefield perfected his skills as the simulation center manager for David Grant Medical Center’s simulation center on Travis Air Force Base. “Other than military and large academic hospitals, it’s rare to find a community hospital investing in a simulation lab. The simuation lab provides every clinical staff member an equal opportunity to learn new skills and correct mistakes in a supportive environment without placing themselves or patients at risk. The NorthBay Simulation Lab includes a “family” of patient simulators consisting of an adult male, a pregnant female, two children, an infant and a newborn, all with amazingly lifelike characteristics. For example, the newborn exhibits umbilical pulses, cries, moves, makes heart and breathing sounds and even turns blue when it simulates difficulty breathing. The trauma mannequin can simulate active bleeding, allow chest tubes to be inserted and have limbs amputated. The pregnant female is programmed to deliver a baby, with many of the complications a delivery can present. Depending on the case, Fronefield can program complications to test how the clinical staff adapt to and recognize life-threatening situations. The lab provides every clinical staff member an equal opportunity to learn new skills and correct mistakes in a supportive environment without placing themselves or patients at risk. Each training scenario is videotaped for students and trainers to view and debrief immediately following the sessions. 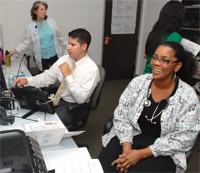 The simulation lab was installed at NorthBay Healthcare’s Administration Center in Green Valley in the fall of 2008. Much of the past year has been devoted to the program development work required to construct training modules and build realistic scenarios to complete clinical staff training, Fronefield explains. The lab has seen heavy use, advancing the skills of NorthBay Healthcare employees since late 2009. “It is our hope to eventually expand our program to include classes for student nurses, paramedics and other healthcare professionals in our community,” Fronefield added.